Words by Kevin Doocey on May 5, 2014 . It is true what they say: players have too much power in the modern game. Extravagant wages, greedy agents, and a sense of invincibility are aspects that one can attribute to many Premier League stars of the 21st century. Often one sees a manager sacked because a number of his players do not feel he is the correct manager for the club. David Moyes’ recent departure from Manchester United was just one example of the majority of his squad failing to pull their weight throughout he season in order to have the Scot fired from his post. It’s a sad state of football nowadays, but then again, there are always exceptions. The debacle between Newcastle manager and our French forward Hatem Ben Arfa is a prime example of where there needs to be a reasonable compromise for the greater of this magnificent football club. After a dire second half of a season in which Ben Arfa rarely featured, Newcastle limped to a 3-0 victory against bottom of the table Cardiff City to mark their first victory since March 22nd. Although I could only watch from a TV screen, the atmosphere at St. James’ Park on Saturday was as toxic as I have ever seen. Countless banners, vociferous chants from a passionate faithful, and the walk-out which saw thousands leave the stadium long before full-time in protest at the current regime. The situation could be summed up in one powerful image, that of Alan Pardew being afraid to leave his bench as to not aggravate the crowd even further. While the result may have looked convincing, the crowd were far from appeased, and it made for powerful viewing, indeed images that went across the world in making a statement of what this club really wants. Although Alan Pardew looks set to secure a Top 10 finish in line with expectations this season, the Englishman should still be relieved of his duties this summer, no doubt about that. As many Newcastle fans would have noticed across the mediums of social media - Hatem Ben Arfa watched the game from the crowed alongside supporters, and later took to the pitch to partake in the ‘lap of appreciation’. The forward has been resigned to training outside of the first team, and his future on Tyneside - under the current stewardship - looks very grim. It should be like this - Ben Arfa is one of the most talented players that Newcastle have had on their books for the past 15 years. His ability to split defences open at will is something the club need for next season. He offers excitement, hope, opportunity - something which Alan Pardew has failed to deploy with his desired line-ups. While it is true that Hatem Ben Arfa can be excruciatingly frustrating to watch at times and can leave his team exposed when attacks break down, he is a player a team must compensate for. His ability to win games deserves this, and as we saw in the famous season in which we finished 5th - the Frenchman can be consistent in the right kind of setup. I emphasise setup because it has been the very thorn in our sides this season. 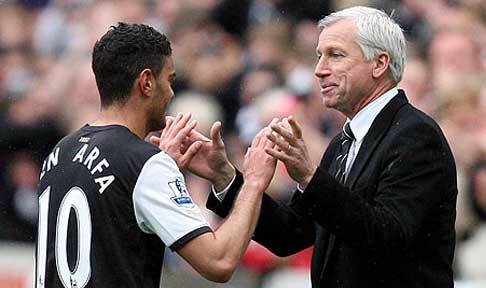 If - as expected - Pardew stays on as manager of Newcastle United, then we can more than likely bid farewell to Ben Arfa. Although the 27 year-old declared his desire to stay at St. James’ and help the team fight for silverware in the future, it looks like he will be flogged under the current managerial setup. That alone, is a great shame. In on of very few cases, this is a situation where the manager should go before the player. At the end of the day, Pardew deserves the sack for not only a horrendous showing in 2014, but also because of his antics on the sideline. He is a poor image for this classy football club, and if Mike Ashley has any desire whatsoever to try appease NUFC fans he will do the honourable thing and sack him. Under the right manager, Ben Arfa could set St. James’ Park alight, yet again. Whether you agree or disagree, comments are welcome as always folks and be sure to follow me on Twitter @KevinDoocey! I couldn't agree less. Setting aside the Pardew debate, Ben Arfa is a complete waste of time. He is worse than a passenger - he's a liability. No point him making a goal if he makes us concede 2. As Gary Neville said about him some months ago on Sky - it's not enough in today's game to be good going forward; to justify a place at the top level a player has to be good enough in all aspects of the game. I've been going to SJP for over 40 years and I cannot understand why so may of our fans are bowled over by show ponies - Jimmy Smith, Malcolm Macdonald, and Obafemi Martins to name a few. I'm afraid Ben Arfa is fat, unfit and has no football brain. Unlike Murvar here, I completely agree with the article. Ben Arfa is the only one (with the possible exception of Sissoko) that can unlock defences. The chances he 'wastes' are those that he himself creates. When was the last time ANYONE put Ben Arfa through on goal? Under the right leadership, he can thrive. Can you imagine Keegan managing Ben Arfa as ineptly as the current manager? Thought not. Keep him, ditch the manager. Have to disagree with the above statement. Why ? Poor management, HBA has sat on the bench only being deployed as a last resort when we are behind. And yes he seemingly did put on weight, that's also something that should have not been allowed by Pardew and his staff. Sitting on the bench is not exactly conducive as far as match fitness is concerned, plus it appears anyone showing a bit of flair, is immediately reined in and sat. Just as Marveaux has been for almost the entire season. We all remember SBR's attempt to get Robert to track back, which he finally gave up on, believing his ability to change the game by scoring or laying on the perfect pass, was more important than using him as a defender. HBA is similar in that regard. Look Pardew has had enough time to build a decent side, but he just doesn't understand the modern game, he has to go and be replaced by someone who does, if we are ever going to see any success at this club. Thanks for the comment, murvar. All opinions are welcomed. However, I agree with chuck and David - Ben Arfa's apparent regression is largely down to poor coaching and management. We saw in 2011/12 what Ben Arfa is capable - West Brom (a), Bolton (h&amp;a) and there are plenty others. In the right setup he can be lethal, and absolutely lethal at that. I find it confusing that you think Ben Arfa has no football brain, for me, he's one of the more smarter players in the team. Granted he can make some poor decision to check back outside a defender after beating him, but his vision is excellent - just look as his assist for Papiss Cissé against Crystal Palace in March; the way in which he calmly pin-points a cross in a high-pressure, injury time moment of the game just oozes quality in my opinion. Sunderland with the same players but a different manager have proved that the manager can make a BIG difference.Motivation ,tactics and a different attitude to the game show that Pardew has not got a clue,but he does have Ashleys support .I wonder if Ashley had bought Spurs would be be doing things the same way ?. I don't get this "losing the ball" claim over HBA, of course he has a tendency to lose the ball, all players do. I've seen Gouffran lose the ball more times in a game than Hatem, more than one occasion leading to a goal, are there calls for him to be dropped? If Pardew says something enough times people buy into it, Hatem is not judged by the same credentials as other players in the team. Why? Because Pardew uses him as a scape goat and everyone buys into it. Thankfully most supporters are seeing through Pardews agenda now. HBA is a forward player not a right back, it's his job to create goals not prevent them. He has one of the best right backs in the league behind him. A decent manager will get him firing them in again, that manager is NOT Pardew. Who knows whats gone on behind the scenes, but certainly the attitude of the player in this example has been one of self-sorrow and disappointment for his current predicament, and one in which he has highlighted a desire to stay and fight on. Most of the players at toon just want to leave and who can blame them for that, so I can’t understand pardew not being sympathetic and understanding in this situation – when the player is demonstrating all the right signs of wanting to correct this situation. Let’s face it, he’s hugely talented on the ball (no-one can deny that) and wants to stay. If we sell him, Ashley will have to fork out serious money to find a replacement of anywhere near his level of quality. Simple solution is to let him stay, train him, coach him, make him a better player and one who works harder for the team. Its possible I’m sure. Plus the fans love watchin him, he’s magical at times and that’s what fills a stadium – it certainly isn’t the prospect of watching gosling, tiote, and anita in midfield I’ll tell you that! Personally, I love him. And I for one think Newcastle are not in a position to sacrifice a hugely effective offensive weapon, despite his current defensive shortcomings. Take your bonus and leave and then we can get away from being dragged into a relegation scrap next season !! Well personally I love to watch HBA play football at times he can be amazing, and this nonsense about him losing the ball and not tracking back is exactly that, nonsense I watch football allot I mean its in my blood, and player like Hazzard, Sanchez, Messi, C.Ronaldo they all lose the ball at times trying to beat defenders with trickery in their numbers, lose the ball, and then just stand there like thy cant believe what's just happened to them do their managers drop them from the team and make them train with the young ones? I think not they would have their tea toast and P45 next morning. The difference is they have a solid unit of defence behind them ready to help out when they do lose the ball, sadly poor Ben Arfa doesn't and has to pick up all the slack from pardew's mistakes. pardew has had plenty time to build a decent side with HBA in it and unleash the beast inside we all know he capable of. And pardew has failed miserably, playing most players out of position and lacking to see where really need's strengthening in the team. With a decent defence and clever central midfielders HBA could be let roam free in the wilderness of the opposing defence ready for that counter attack. how can pardew not see coloccini needs a decent partner he can rely on strong clever and with a bit pace to take the pressure off him in central defence, or how if sissoko played along side tiote in central midfield how much stronger the defence would be, don't get me wrong he's unbelievable going forward, but his sheer size and strength along side tiote's would strengthen up the middle of the park to now leave Cabella, Seim de jong and HBA to play along the front with a proven striker. Prdew for SACK now before we lose a beauty.